Jobber is an online field service management solution designed to help expand the capabilities of small businesses. Easy to use and reliable, it caters to thousands of field service providers and their office administrators in their need to boost operational efficiency. Through Jobber’s wide array of robust tools, small businesses will be able to offer top-of-the-line service experience without considerably affecting their typically tight budget and limited resources. This platform offers a wide array of benefits. Jobber’s client hub is a self-serve portal that allows your customers to approve quotes, check appointment details, pay outstanding invoices, print receipts, or request for more work at any time. Jobber is highly flexible that you can easily make job quotations, plan work schedules, and create invoices using either desktops or mobile device with just a few clicks. It also helps you prepare job routes, monitor, and deploy individual and teams without the usual hassle and intricacies. Its efficient communication tools provide timely notifications and conversations with your clients, while its integration features allow users to take advantage of benefits like automatic syncing with accounting apps and other solutions that you and your team are already familiar with. 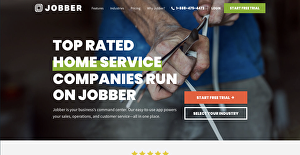 Jobber is designed to help organize professional services firms in managing their teams of service experts that include plumbers, landscapers, residential cleaners, general contractors, and many more. With Jobber, you’ll be able to send invoices faster, thus you’ll get paid more quickly. What’s more, the vendor’s team of committed customer support is readily accessible for help 24/7. From the demand for effective scheduling to reliable client monitoring to reporting, businesses use Jobber to address their diverse requirements. Still, they all have that same need for a dependable solution that can help them better manage their businesses, which this platform is specifically made to provide. Jobber is designed to be a central hub for managing your business. Its user-friendly tools help your various business aspects—customer service, operations, and sales—achieve efficiency using a single location. With Jobber, you will have ready access to indispensable tools in providing quality service to your clients. It removes the burdensome paperwork, repetitive data entry tasks, and manual practices which is why this platform is known among its clients as helpful in providing time and cost savings. With all the cumbersome tasks eliminated, you can focus on more important things like leading your business to further growth. Scheduling is always difficult, even if you have enough manpower to deploy. With just a few clicks, this solution allows you to easily generate jobs, select clients, and assign to your teams. Jobber provides the flexibility that you need to perform your business tasks faster and more efficiently. Its multiple calendar views help a lot in deploying your team properly and on a timely basis as it provides a clearer view of your team’s availability. Business owners and managers are usually busy, but this is not a good excuse to overlook billing your clients. Using Jobber’s customizable invoicing process, your invoicing can become easier so you’ll get paid faster. Aside from reminding you when to make and send invoices, users can benefit from its other features such as payment tracking, batch invoicing, invoice templates, and past due notifications. Its CRM tools allow businesses to closely monitor important customers wherever they are—out in the field while traveling, and in the office. It helps businesses become more organized and professional especially when dealing with their clients. Jobber’s CRM features include note linking, notes and attachments, client search, and full client history. Simple to set up, Jobber Payments allows you to accept payments via credit cards anywhere, in the office or even in the field. When you send invoices to your clients, they also have the option to pay via your client hub. This tool enables you to vault customer information securely and, once the job is completed, charge them automatically. With Jobber, you can effortlessly create jobs, convert job quotes or requests into actual work, or arrange for new job assignments on the fly. Comprehensive job requirements can easily be determined as this solution integrates service notes and items with customer and property information. Use Jobber’s calendar to easily check ongoing jobs and readily assign or change assignments of your team members. You can also quickly notify your team members via their mobile app about any new or changes in schedules. You and your team will gain complete control of every project cost as Jobber allows easy expense tracking any time and wherever you are. Even when you make purchases on the field, you can simply take photos of receipts and upload them via the Jobber app, ensuring that all your records are updated and with their corresponding attachments. With Jobber, you can have complete control of your project teams and even know their various locations in real time via GPS tracking and waypoints. A pin is automatically dropped in its in-app map every time they clock in, make an invoice, or modify/update job details, so you can easily monitor the precise locations of their activities. This helps a lot in the job, HR management, and financial monitoring and recording of your projects, among its many benefits. What Problems Will Jobber Solve? Solution: Before Jobber, I’d spend 2 hours each night text messaging my team members their schedule for the next morning. Because we do everything manually, our paper work is in a mess that it takes hours to process job orders, where delays and issues are a common thing. Most of the time, I’m a few months behind on invoicing, which is why clients pay us late, so my teams aren’t paid on time. With Jobber, we are able to save more than 10 hours a week in completing tasks as it helps us manage and automate our important day-to-day workflows so we get the job done and get paid—faster. Solution: Before Jobber, I’d spend most of my day playing phone tag with my clients, trying hard to keep up with their requests. I needed to try finding time to call or email clients in between, or even worse, while on a job, to get them to approve quotes, remind them about upcoming appointments, to try to collect payments, send them receipts they’ve asked for, and more. Now, with Jobber’s client hub, our clients can self-serve on many things they need: approve and sign quotes, pay deposits, check on who’s coming and when, make a payment, print receipts, or request for more work—all in just a few clicks. We’re also able to provide better customer service without the extra back-and-forth. Jobber helps us provide a positive experience for our clients that enhanced our company image, while repeat orders had become a common thing. Solution: Before Jobber, I was so busy with my everyday tasks, always toxic at work that I can’t find time to focus on things that can help my business grow. By making my processes more efficient and by empowering my team with what they need, Jobber has allowed me to gain full control of my business, to stay on top of things, and to start scaling my business. My cash flow is now strong because I’ve made it easy for my customers to pay online, and we’ve started receiving feedback on every job so I can now directly address any weak areas in my operations. We’re now receiving many reviews/recommendations from our happy clients, so we’re steadily building our business reputation. And ever since I’ve added Jobber’s work requests to my website and social media accounts, I get around 36 new leads on a monthly basis. Overall, not only was I able to spend more quality personal time with my family, I can now work smarter and focus on the more important things that business owners should be doing, like attracting new clients, motivating my teams, etc. Each company has its own characteristics, and might require a special Billing and Invoicing Software solution that will be fit for their business size, type of customers and employees and even particular niche they cater to. It's not wise to count on getting a perfect software that is going to work for every business regardless of their background is. It may be a good idea to read a few Jobber reviews first and even then you should remember what the service is supposed to do for your company and your workers. Do you need an easy and intuitive service with just basic functions? Will you actually make use of the advanced functionalities required by experts and big enterprises? Are there any particular tools that are especially useful for the industry you work in? If you ask yourself these questions it is going to be much easier to locate a trustworthy app that will match your budget. We realize that when you make a decision to buy Field Service Management Software - FSM it’s important not only to see how experts evaluate it in their reviews, but also to find out if the real people and companies that buy it are actually satisfied with the product. That’s why we’ve created our behavior-based Customer Satisfaction Algorithm™ that gathers customer reviews, comments and Jobber reviews across a wide range of social media sites. The data is then presented in an easy to digest form showing how many people had positive and negative experience with Jobber. With that information at hand you should be equipped to make an informed buying decision that you won’t regret. What are Jobber pricing details? What integrations are available for Jobber? Pros: I like everything about Jobber. The layout is good and the features are easy to use. I’m sure it will make it easy to manage my cleaning business. We are a startup, but expanding quickly. I think Jobber will help us grow fast by reducing mistakes and hassles. Cons: My only peeve is about the price which can zoom up after you add pro users as well as add-ons. But I have no complaints as the product is well worth the money invested. Pros: We have just started using Jobber and are not utilizing its full potential at the moment. It syncs with Quickbooks which is very useful. We aren’t currently using Jobber’s invoicing feature, but simply raise invoices in QB and sync the info with client files in Jobber. The software is ideal for small businesses. The vendor offer fast and impeccable customer support. Cons: There are no visible drawbacks to point out. But as I mentioned earlier we have been using the software for only a short period and are taking our time to understand all the features.